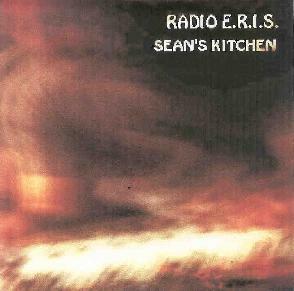 Radio E.R.I.S. - "Sean's Kitchen"
An interesting collection of improvised(?) instrumentals from the duo of Sean O'Donnell and Matt Stevenson. Even though most, if not all, of the tracks rely on loop rhythm beds and/or electronic percussion, there's an unquestionable organic quality to the assemblage of sounds, built pretty much entirely from a great variety of keyboards/synths, and percussion. Shimmering pianos, organ smears straight out of Miles' 70s recordings, synth tones ranging from the cheesy to the sublime - they use the "hold" function on their delay units effectively (and annoyingly!). None of it is virtuostic, but most of it exhibits a relaxed, human feel; the improvisations sound well thought-out (is that an oxymoron?). The final track, the four-part, 21-minute "Schuylkill Bridge Suite" (an homage to their Philadelphia home and its public transportation), showcases the variety of Radio E.R.I.S., from an evolving drone with layers added up to a sonic climax giving way to cut-up (does anyone still splice tape these days? ), off-kilter rhythms, and sparse percussives capped off with a growing chordal groove, with a final section of repetitive rhythms becoming progressively, but never extremely, locomotive. To be fair, there's certainly some aimless noodling that's not really necessary here ("Books"); the kind of sounds that, if you absolutely must hear them, you can easily make yourself (possibly with the assistance of like-minded bandmates/friends/children/co-workers/pets). But definitely recommended for those into the jazzier side (Alien Planetscapes, Cookin' With Kurt, W.O.O. etc.) of experimental rock. For more information you can visit the Orange Entropy web site at: http://www.orangeeentropy.com. Contact via snail mail c/o Orange Entropy; PO Box 1198; Hightstown, NJ 08520.